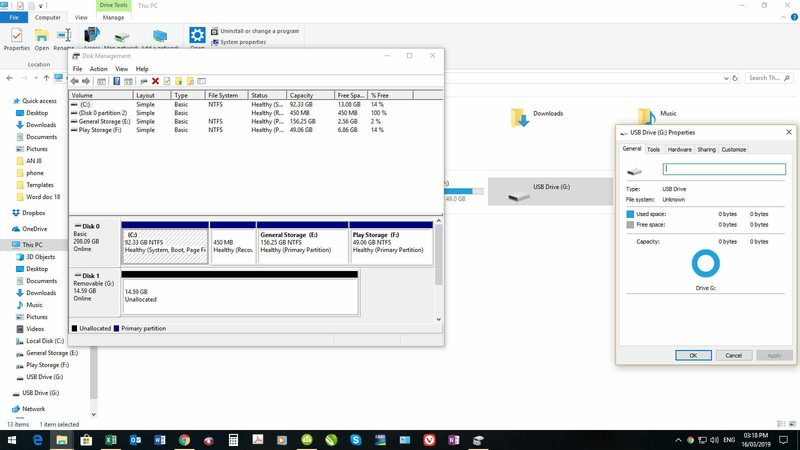 I used ramus 3.4 to make this a bootable pendrive for win 10. I formatted it, and loaded some films on it to transfer to a win 7 machine, it showed the files but some where empty folders. If I look in disk management removable G, no media. General: Sandisk Cruzer Glide USB drive this drive working properly. 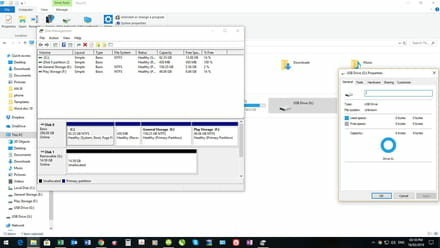 When I put it into another USB slot after the green line as finished it reads the file as usb 16Gb show blue line as used space, when I press to open it reverts back to just a drive letter, greyed out box. Why did you put your files behind that middleware? Your best bet is to remove that front end. What makes it bootable? What benefit does the BOOTABLE portion bring to you? Just use it as a drive. originally I used the drive as bootable disk to reinstall win on my computer, then I formatted it added my film files. this is when it started to read/show blank. I don't know how to clear it, as it wont format. Open it in disk management, and delete the volume. Then build a new volume. I think you have a DEAD ONE! Ok, then right click over the unallocated disk space, and select new volume.